Campfire magic. It’s not voodoo. Campfire magic. No, we are not going to go into strange magic tricks, what we are going to do is tell you how you can add some chemicals to your fire and create a dazzling spectacle of colors what will amaze everyone. You may not want to do this all of the time as the novelty will soon wear off. Do them in a timely fashion and keep the kids surprised. Adding a small amount of chemicals to a hot burning fire can have an 'Ooooh-aaaah' effect. It's important to do these only after all cooking has been done on the fire and when there is little wind so the smoke can rise up rather than into campers' faces. You may be able to purchase these chemicals in a grocery or dry goods store, in the laundry or cleaner section. Find copper sulfate in swimming pool supplies. You may even try the local drug store. Find copper sulfate in swimming pool supply stores. Epsom salts, borax, and calcium chloride may be found with laundry/cleaning supplies. Copper Chloride, Strontium Chloride, and others my be best found at fireworks supply companies. A company called www.skylighter.com sell a very wide range of items. Practice before using them at a campfire so you know how much to use and how to best apply for maximum effect. Listed here are some chemicals and the flame color they produce. There are many ways to get the chemicals into the fire. The bottom six chemicals can be simply tossed into the fire in small amounts. Toss them sparingly for the best effect. Use an old tea spoon or table spoon. You will look like Merlin the magician as you toss your ingredients into the fire and create your campfire magic. For all of the rest you will need to prepare the chemicals at home before hand. You can purchase paraffin blocks or you can use old candle wax from around the house or pick some up at a goodwill store or a Salvation Army store. Using small paper Dixie cups, pour in about ¼ inch of a chemical into each cup. Melt the wax in a double boiler. Pour just enough wax into the cup on top of the chemical and using a stir stick gently mix the two together. You want to make sure each of the little pieces of chemical is coated with tax. Once cooled, you may cut off the part of the Dixie cup that is not needed. Just toss one of these little dandies into the hottest part of the campfire and get ready for a good show. You may want to mix a couple of chemicals together for an even better display of campfire magic. Another idea for the campfire is to make what traditionally is called a Yule Log. Instead of using it in the fireplace you can use it to create the campfire magic. Be careful that your children stay away from the coloring chemicals they can be harmful. To make these logs you must use regular, not shiny, newspaper. This is something you may want to do during those cold winter nights as they take at least a month to dry. Tightly roll and tie the newspapers about the size of a fireplace log. In a bucket, mix the ingredients, 2 pounds of coarse salt, 2 pounds of bluestone and 2 gallons of boiling water. Add in any of the coloring chemicals as above. One ounce of each color. Place the rolled up newspaper rolls into the bucket and let them absorb all of the liquid. After a couple of days, take them out of the bucket and place them on a rack to dry for a month. Once dried take them along for the first trip and create fantastic campfire magic for the whole family to enjoy. 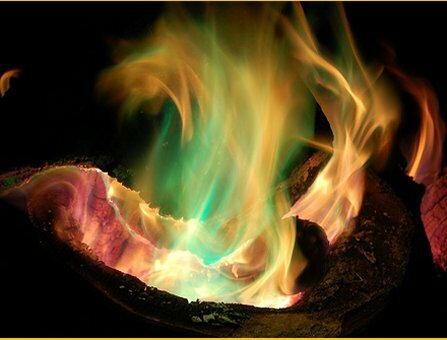 Place one in the fire once it is nice and hot and it will burn for a long time giving off many beautiful colors. To add more fun to your camping experience look up some short campfire ghost stories and campfire games and campfire songs. Campfire cooking can be livened up if you throw in some dutch oven campfire recipes. Campfire cooking recipes give you a chance to show off your cooking skills. You could call your site the campfire cafe. Sometimes campers wake up at odd hours. Advise those adults who may be inclined to do so to keep a 24 hour campfire going to add to the campfire magic. One note of caution. There are two things you want to be cautious of buying, discount tents and discount trailer hitches. Ask yourself "why are they discounted?" If they are marked down during a sale then you have a bargain. Otherwise, caution is advised. These things can leave you in a lurch. Coleman tents and Coleman tent campers are the kind of quality you want to have. Coleman tent trailer prices used to be real bargains but like everything else, prices have risen over the years. Camping breakfast. Come on Dad. Be the hero. You'll never regret it.